Friday night we were the victims of a heinous crime. Not one, not two, not even three, but four times, a certain little criminal named Miss Madison, who is not even five months old, moved herself forward and crawled to her pacifier. We were fortunate enough to catch this elusive criminal in the act. 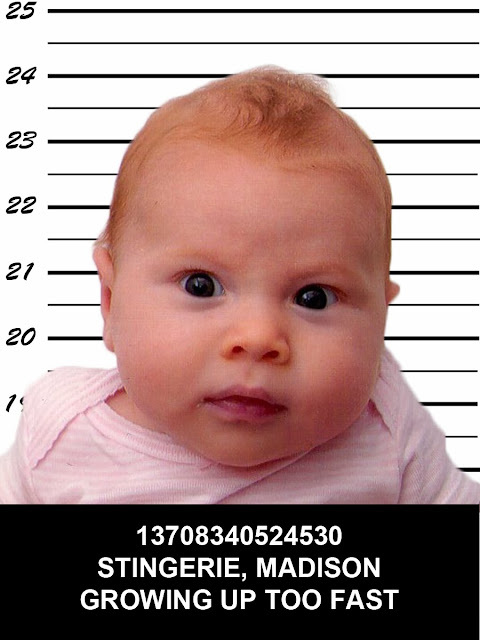 As of now she's been apprehended and is being held without bail until a suitable punishment can be determined. She used her one phone call behind bars to reach out to her lawyer, who was unavailable to comment at this time.